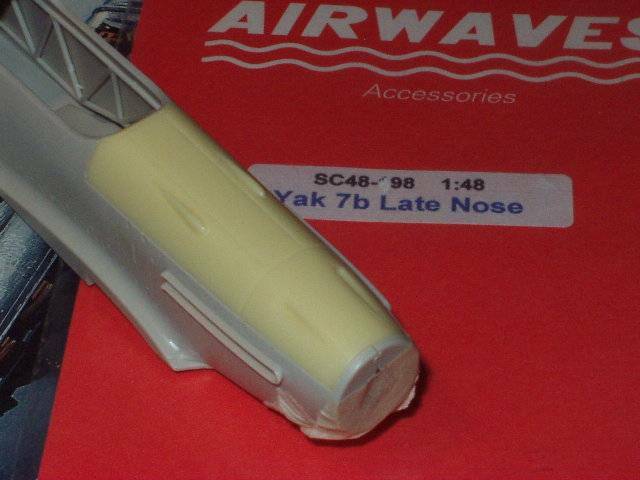 Having demonstrated mastery of all things Yak, our own Hero of Soviet Modeling Peter Vill has set about passing on some of his inspiring Yak model work to the rest of us. Teaming up with E.D. Models, Peter has produced a master for a Yak-7B nose intended for use with the ICM kits. E.D. 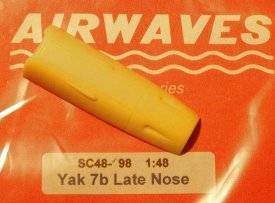 Models have released this part in 1:48 scale under their Airwaves line, and were kind enough to supply an example for our site to look over and review. 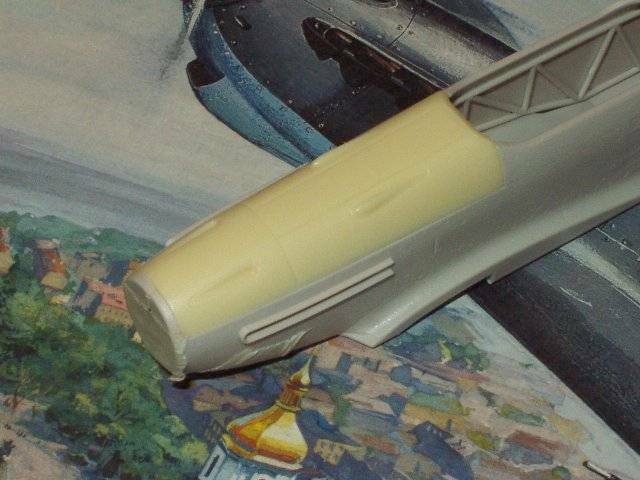 This replacement upper cowling piece was designed to enable modelers to make a conversion of the ICM Yak-9 into a Yak-7B with cut-down rear fuselage, but it might also be used to convert the ICM Yak-7A kit into a Yak-7B. The piece is delicately cast in a light tan resin of outstanding properties. I took the occasion to test-glue some bits of plastic to the underside, and this resin seemed to respond equally well to all of the glues I tried, including CA (super-glue), bonding mastic ("Goop"), PS cement, and even white glue. On my example, there is not a single error, dimple, or mold defect to be found-- the casting technique is exquisite. The engraved line detail has been replicated with equal success, and replicates the detail depth and style on the ICM kit perfectly. The shape and accuracy of the blisters and gun port openings are spot-on. You can see in the photo how good the fit of this part really is; in fact, it is perfect. I doubt if the resulting joint will require putty or finishing of any kind. The instructions sheet does indicate that the kit supplied engine cannot be used with this part, so those wishing to include the motor take note. I suspect that you might be able dremel the underside of the resin replacement cowling to accept the engine, but that would be quite a chore, and so I agree that the two are really not compatible. Well, I have to apologize if this review sounds more like an advertisement. We don't hand out too many "100" scores around here, but I just cannot think of any other suitable number. Fundamentally, this resin part is in fact perfectly sound, and my example without error. Or, more simply put, if I were to undertake a Yak-9 to Yak-7 conversion (and who wouldn't want to at least one of these? ), I can't imagine being without this neat little resin job.